The resort is entered through a private gatehouse and has five buildings holding 150 air-conditioned, one and two bedroom suites sleeping up to six persons. Although Ocean Pointe rests in an isolated tropical setting, it is only minutes from area attractions, fine dining and shopping. The hotel offers FREE continental breakfast buffet. 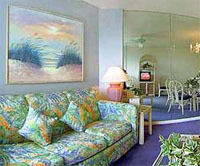 If you are tired of the "same old Florida vacation," try Ocean Pointe Suites at Key Largo for something different. 150 rooms. Dining: All guests have the option of a complimentary Continental breakfast served every morning at Ocean Pointe Cafe and Lounge. Ocean Pointe Cafe and Lounge - Located on the second floor of the registration building, overlooking the marina and ocean. Open for breakfast daily, then serving sandwiches, salads, pizza, and snacks to accompany cocktails during afternoons and evenings. Recreation: The resort includes two lighted tennis courts and a beach volleyball court. Kayaks, scuba and snorkeling gear, and boats can be rented from the harbormaster. The recreational activities listed below are available near the hotel; fees may apply. Activity: Fishing, diving, snorkeling, windsurfing, & jet skiing facilities are just minutes away, along with glass bottom boat rides and water parks featuring "swim with the dolphins."